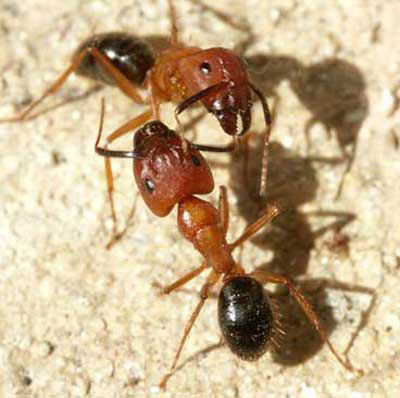 The Florida carpenter ant complex is comprised of several species, two of which are common around structures: Camponotus floridanus (Buckley) and Camponotus tortuganus (Emery). These bicolored arboreal ants are among the largest ants found in Florida, making them apparent as they forage or fly indoors and out. Figure 1. Major workers of Camponatus sp. Photograph by Rudolf H. Scheffrahn, University of Florida. In a survey of common urban pest ant species covering four metropolitan areas of Florida (Daytona-Orlando, Tampa Bay area, Sarasota-Ft. Myers, and the greater Miami area), Klotz et al. 1995 found that infestations of Florida carpenter ants accounted for approximately 20% of all ant complaints by homeowners. Klotz et al. (1995) found only a few instances where other ants, including imported fire ant (Solenopsis invicta Buren), crazy ant (Paratrechina longicornis (Latreille), ghost ant (Tapinoma melanocephalum (Fabr. 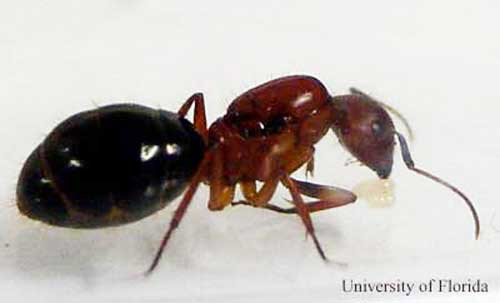 ), and pharaoh ant (Monomorium pharaonis (L.)) were more frequently encountered in buildings than carpenter ants. During the flight season, carpenter ants can often be found in alarming numbers. Sometimes homeowners are concerned about damage to the structural integrity of their homes, which they sometimes incorrectly learn, is caused by Florida carpenter ants. 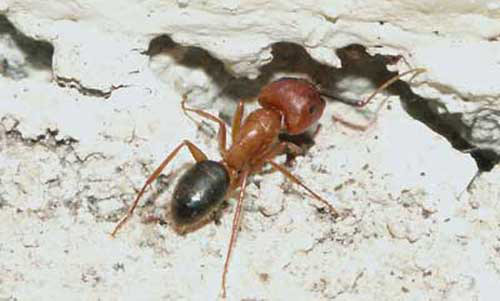 However, unlike the wood-damaging black carpenter ant, Camponotus pennsylvanicus (DeGreer), found in Florida's panhandle and a few other western U.S. species, Florida carpenter ants seek either existing voids in which to nest or excavate only soft materials such as rotten or pithy wood and Styrofoam. Other concerns are that these ants sting (they do not) and bite (they do). In recent years, a small and exotic daytime-foraging carpenter ant, C. planatus Roger, has become common in many parts of central and southern Florida. Figure 2. Camponotus floridanus is found widely distributed throughout Florida and some neighboring states, while C. tortuganus is limited to central and southern portions of Florida. 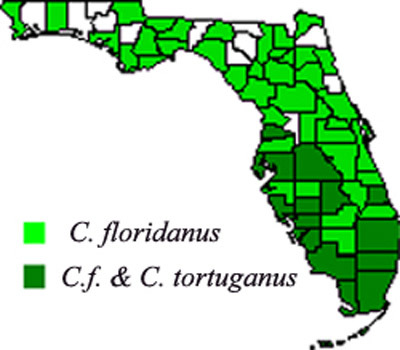 The ratio of C. floridanus to C. tortuganus is about 2:1 in south Florida. 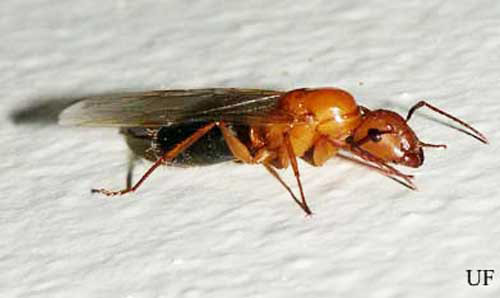 There are several other Camponotus species found in Florida, however, these are rare or usually not associated with buildings. These species include Camponotus caryae (Fitch), C. castaneus (Latreille), C. decipiens Emery, C. discolor (Buckley), C. impressus (Roger), C. nearcticus Emery, C. pylartes Wheeler, C. sexguttatus (Fabr. ), C. snellingi Bolton, and C. socius Roger. Figure 3. Female alate (reproductive) of the Florida carpenter ant, Camponatus floridanus (Buckley). Photograph by Rudolf H. Scheffrahn, University of Florida. Figure 4. 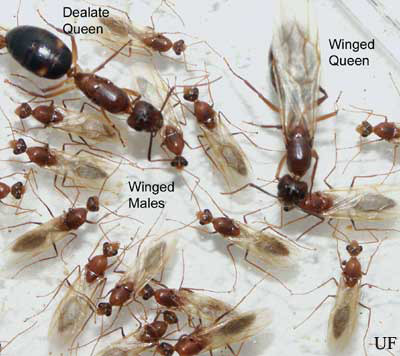 Male and female reproductives of the Tortugas carpenter ant, Camponatus tortuganus (Emery). Photograph by Rudolf H. Scheffrahn, University of Florida. Figure 5. Worker and male reproductives of the Tortugas carpenter ant, Camponatus tortuganus (Emery). Notice that worker's head is longer than broad. Photograph by Rudolf H. Scheffrahn, University of Florida. Figure 6. Florida carpenter ant, Camponotus floridanus (Buckley), dealate queen tending brood. A dealate is a reproductive that has shed its wings. The adults that emerge from this brood will be small ants called minums, and they take over the queen's brood-tending functions so she can concentrate on laying eggs. 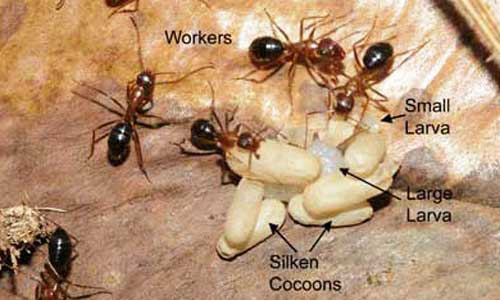 The brood that emerge after the minums should be normal sized worker ants. Photograph by John Warner, University of Florida. Figure 8. Florida carpenter ant workers, Camponatus floridanus (Buckley), from neighboring colonies fighting. Photograph by Rudolf H. Scheffrahn, University of Florida. 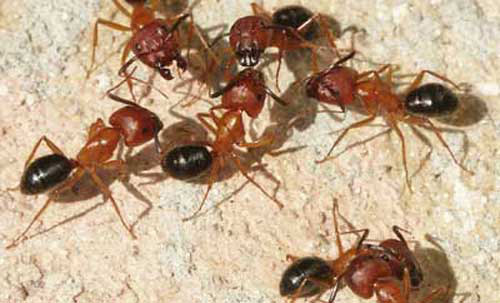 Carpenter ants are one of the most common indoor insect pests in Florida. 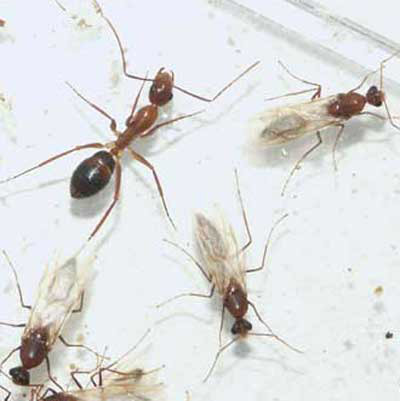 Alarmed homeowners often see these ants foraging (especially at night) and either attempt to control the ants with spray insecticides or call their local pest control operator (PCO). PCOs report going to innumerable homes to speak with frantic homeowners who have failed to control foraging or flying carpenter ants. Many PCOs and seasoned entomologists have resigned to failure after not being able to treat hidden nesting sites, sometimes after years of trying! An experienced pest control operator, or a determined homeowner, can usually follow a trail of ants back to the ants' nesting site and treat it (see Management below). Carpenter ants, like many other ants, will trail along wires or cables that may be attached to homes and serve frequently as access routes for them to enter attics and other above ground areas. Tall trees touching structures cause "bridges" which provide foraging access into buildings. Common exterior nesting sites include: old drywood termite galleries and wooden objects that have had previous damage from other organisms including insects or fungi; rotting tree stumps and tree holes or crotches between limbs; under old leaf petioles in palms, especially in and around the inflorescence of coconut palms; under bark, in roots of trees, especially citrus trees; in old wooden fences, sheds, old wooden decks, bamboo poles (even thin or short pieces) or tree supports, debris of almost any kind, coconuts left on the ground, under mulch, inside logs or wooden borders in gardens, railroad ties, old shoes, in voids in ceramic or concrete decorations, walls or support pillars, in expansion joints either not filled in or filled with rubbery materials, under stones, in home exterior coverings, especially wood panels, and so on. Common interior nesting sites include: wall voids (especially walls that have moisture seepage), under attic insulation and usually near the eaves where they are very difficult to reach, under bath tubs, very common under windows and door frames which have moisture intrusion from rain or sprinklers, around skylights, in boxes or paper bags, in closets which are not often used, under appliances, especially dish washers, in flat roofs (one of the most difficult problems due to lack of adequate access), behind wood panels, in wood furniture, cracks in floors, under bathroom fixtures, and many other places! Carpenter ants are sometimes found in electrical boxes, such as fuse, meter, or timer boxes or appliances. Unusual nest sites have included a computer printer, a radio, and a pay phone. Also check hollow supports of patio screens or voids in patio ceilings. Observation of foragers entering voids is the best means of finding the nest. Watch for trailing ants at their peak nocturnal foraging hours and follow them. Look for areas of higher ant population density indicating closer proximity to the nest. Placing a few drops of sugar water, honey or dead insects along a trail can cause other nestmates to be recruited to the area. Try to follow the foragers back to the nest and then treat the nest. Figure 11. Worker of the Florida carpenter ant, Camponatus floridanus (Buckley), entering a void. Photograph by Rudolf H. Scheffrahn, University of Florida. There are many situations in which the nest is not accessible, or cannott be found. In those cases use one of the baits made for carpenter ants, and follow the label directions. Usually baits are simply placed along the trail and foragers bring the toxic baits back to the nest where food and toxicant are shared via trophallaxis (communal food sharing). Carpenter ants are finicky eaters and tend not to recruit in large numbers to any food source thus decreasing the efficacy of insecticidal baits. Residual sprays in foraging areas can also be helpful. Be sure to spray areas where ants are feeding, such as trees and shrubs. A systemic insecticide can help control aphids and other honeydew producers to reduce food for the carpenter ants. Eliminate "bridges" caused by trees and shrubs touching house exteriors. If wires or power cables are being used as bridges, it may be possible to have a professional treat the wires or areas where the wires attach to the structure. There are a number of "pest barrier" substances available that are sticky and can be used on tree trunks and other places to stop ants from passing. Caulking exterior openings and weather striping may also aid in control. Read and follow label instructions and precautions before using any insecticide. Deyrup MA. 1991. Exotic Ants of the Florida Keys (Hymenoptera: Formicidae). Proceedings of the 4th Symposium on the Natural History of the Bahamas, June 7-11, 1991. 21 pp. Deyrup MA, Carlin N, Trager J, Umphrey G. 1988. A Review of the Ants of the Florida Keys. Florida Entomologist 71: 165-6. Klotz JH, Mangold JR, Vail KM, Davis Jr. LR, Patterson RS, 1995. A Survey of the Urban Pest Ants (Hymenoptera: Formicidae) of Peninsular Florida. Florida Entomologist 78: 112-3. United States Department of Agriculture, 1945. House-Infesting Ants of the Eastern United States, Their Recognition, Biology, and Economic Importance. Technical Bulletin No. 1326, Agricultural Research Service. 61-74. Vail K, Davis L, Wojcik D, Koehler PG, Williams D, 1994. Structure-Invading Ants of Florida. Cooperative Extension Service, University of Florida, Institute of Food and Agricultural Sciences. SP164. 13-14. Wheeler WM. 1932. A List of the Ants of Florida with Descriptions of New Forms. New York Entomological Society, Vol. XL, No. 1. 13-16. Publication Date: July 2002. Latest revision: September 2004. Reviewed: December 2017.